CCleaner 3.10 is the numberone tool for cleaning your Windows or Macintosh. It protects your privacy online and makes your computer faster and more secure. Easy to use and a small, fast install or download. 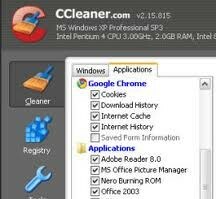 CCleaner 3.10 for clean firefox, internet explorer, safari, opera, google chrome temporary files, history, cookies, download history, form histor and cleaner for Windows (Recycle Bin, Recent Documents, Temporary files and Log files) and Registry (Advanced features to remove unused and old registry entries).